Under the supervision of its Interim Librarian, (new permanent Librarian tba), and with Council contributions, Yale maintains one of the most extensive Southeast Asia collections in the United States. The Yale University Library began collecting material on Southeast Asia in 1899, when Clive Day was appointed to its faculty and a teaching program concerning Southeast Asia was initiated (see Yale SEAS History). It was due to this early start that the library was able to acquire many of its now out-of-print serials, especially from the Dutch East Indies. Historical developments after the Second World War provided a further impetus to the program, and in 1947 Yale established its Southeast Asia Studies Program, the first area studies program in the United States to embark on the study of Southeast Asia in all disciplines. The library added special staff to work in this area and to assure continuous acquisition of this material, now designated as the Southeast Asia Collection. Yale has participated in the PL-480 Program for acquisitions of Indonesian materials since its inception. The program is now called the Library of Congress Southeast Asia Cooperative Acquisitions Program and has expanded to include Malaysia, Singapore, and Brunei. The library also has agents in the Philippines, Vietnam, and Thailand, and for a number of years received Cambodian materials from a friend of the Library who was stationed in Phnom Penh. Two distinctive collections that have come to the library are the Maurice Durand Collection, which is particularly strong in the literature, history, and civilization of Indo-China, and the Yeh Hua Fen Collection, which consists mainly of books on Malaysia and Singapore. The Yale Cambodian Genocide Program, has studied the tragedy during the Khmer Rouge revolution between 1975 and 1979, and compiled information on the Pol Pot Khmer Rouge regime. This information has been made accessible to Cambodians, international scholars, and legal professionals. There are four searchable databases: bibliographic, biographic, photographic and geographic. The Southeast Asia Reading Room and adjacent seminar room are located on the second floor of Sterling Memorial Library, room 214. Following relocation and renovation in the fall of 2013, the new reading room contains comfortable seating and a round study table. 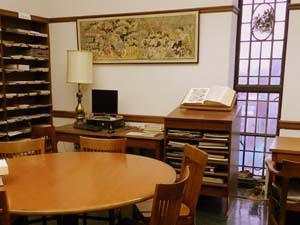 The reading room houses the current periodical collection of Southeast Asian studies journals. An interior room contains core reference collections of printed works including bibliographies, atlases, dictionaries, and an expandable seminar table which seats up to 8 people, with a flat screen monitor on the wall for presentations and classroom use. The Collection maintains print and online archives of periodicals and newspapers from all parts of Southeast Asia.